Guidance Please - Shaving off 1/8 "
Greetings – new member – I find the LJ projects and discussions very helpful. To my issue – I created a 5 piece poplar glueup panel to insert into a rabbet cut into a headboard bed frame. The finished panel is about 1/8” too wide on the long side. The panel is 56×21 x 1/2” so it’s a bit large/unwieldy for my jobsite tablesaw. Looking for advice – do I carefully trim it to size on the tablesaw or trading places. would you recommend using the router with a template or flush trim bit. I don’t own a tracksaw so that’s not an option. The edge will be behind the 3/8” rebbeted recess so unless I really mess up in a big way, the cut won’t be visible. Also had a hiccup with the rabbet where I presume that I tried to remove too much stock or advanced the router in the wrong direction (maybe both) – resulted in a tearout/splintering for about 2 inches. Best to repair by applying glue and compress the material back to form (and putty/sand to hide) or remove the damage and build up a repair using wood putty exclusively. The unit will be painted. Still new with very little experience so I look to Lumberjocks and YouTube for learning and ideas. The content you provide has been extremely beneficial. Do you have a hand plane? If not now would be a great time to get one. Perfect for fitting panels. handplane would be my first choice as well, but I’ve already got a bunch and can use them well. You could use a circular saw with no track, if you have 3/8” to spare you should be able to stay in that width. 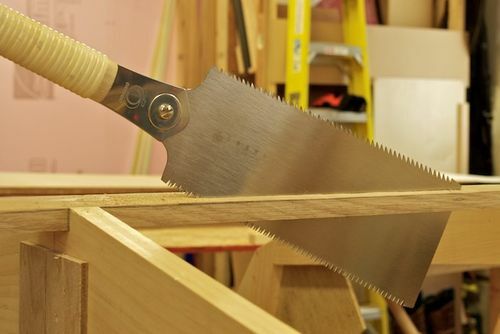 You can also just use any straight edge as a guide for the circular saw, or router as well. +1 on adding handplanes to your skill set. Perhaps not for this project but in the long run it would be beneficial. Hand plane, hand-held power plane, router with guide, circular saw, are all viable. Cutting the rabbet deeper with a router would also work. For a painted project, Bondo is better for patching than putty, as it sets up hard but is easy to sand flush. I’m not sure if this was suggested. youtube video by ‘Jonatha Katz-Moses’ showing how to set hand plane blades (depth and squareness). and how to test for depth and squareness. and the opening of the frog. https://www.youtube.com/watch?v=QYiALzXkOWk I see it’s been suggested. Want to say thanks for the replies. I ratcheted up some courage and decided to learn how to use a plane (without destroying all prior work). Thanks also for the YouTube referrals – this was beneficial. Long story short, I marked the panel and used the plane to remove the excess material to that line. Worked perfectly. And I used the Bondo as suggested to fix the routing tear out. Just finished the final sand, will prime tonight and paint and topcoat tomorrow. Very appreciative to have the LumberJocks site for inspiration/guidance- I hope to be able to help others as my skills progress.